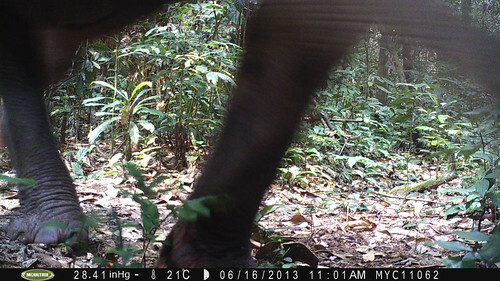 After all, the camera trap is a novelty, although it strives to be too cryptic to notice. These bonobos are at least mildly spooked. Perhaps it is the metallic taste or a residual human odor. Is the leopard trying to elicit a reaction? Even Congo Peafowl seem intrigued….are they seeing their reflection in that bit of glass? And a group of Lesula, newly discovered terrestrial primate species, gather to examine it from a few angles. But generally the camera trap inspection and “mild alarm” do not result in marked avoidance or any perceptible change of behavior. Nevertheless, the elephant’s “curiosity” — not surprisingly – has led to loss of camera traps. A sort of innocent thievery. 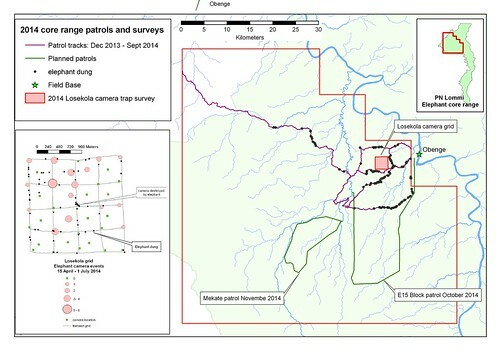 Elephants moved over a camera trap grid set up on the Losekola study area in the northern Lomami Park. Where the dung was most abundant, the camera trap disappeared. This entry was written by Terese Hart, posted on 2014-12-14 at 8:14 pm, filed under Bonobo, Elephant, The Forest. Bookmark the permalink. Follow any comments here with the RSS feed for this post. Post a comment or leave a trackback: Trackback URL. These video clips are fantastic! As always thanks for posting. 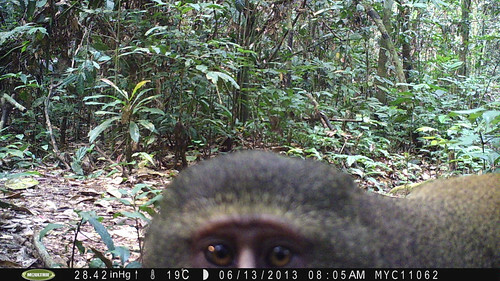 Love the camera trap clips! Its great to see a troupeau of 6 elephants in PN Lomami! One of them really seemed to be huge – all legs.